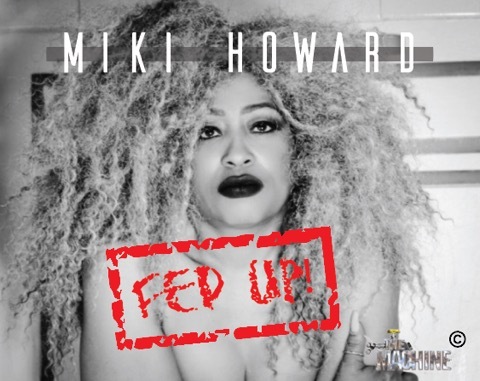 Songstress Miki Howard Returns With a Brand New Single – FED UP! The legendary Miki Howard has redefined herself again by going back to her roots of Southern Soul Blues with Chicago style steppin for her new single FED UP! With mega hits such as Love Under New Management and Come Share My Love she has been a trailblazer for women dealing with love and domestic violence but being strong to overcome and rise to the top. Bio: Born in Chicago, Illinois, Alicia Michelle “Miki” Howard was the daughter of two well-known gospel singers. When Howard was in her early teens, her mother moved the family to Los Angeles. Already aiming at a career in music, the 15-year old Howard received her first break when she participated in a teen beauty contest. Augie Johnson, leader of the group Side Effect, happened to be in the audience; impressed with Howard’s singing talent, Howard also joined the lineup of Side Effect in 1978 when another singer departed. She sang with Side Effect until 1982. Howard signed a contract with Atlantic Records in the mid-1980s and recorded her first solo album, “Come Share My Love”, in 1986. The title track from the album was its first single, hitting the top ten of the R&B charts and reaching number five in late 1986. A remake of the pop standard “Imagination,” which Howard had fought to include on “Come Share My Love”, was another hit from the album. Her second solo album, 1988’s “Love Confessions”, offered another top-five R&B hit with “Baby Be Mine.” “That’s What Love Is,” a duet with Gerald Levert, also hit the R&B charts. In the meantime, Howard’s third solo album,” Miki Howard”, was released in 1989 and proved her most commercially successful to date. The single “Ain’t Nuthin’ in the World” became Howard’s first number-one hit on the R&B charts and another song, “Love Under New Management,” followed it to number two and became one of Howard’s signature tunes. “Ain’t Nobody like You,” became Howard’s second number-one R&B hit. The subsequent album, 1992’s “Femme Fatale”, featured Howard’s renditions of classic tracks originally performed by Dinah Washington (“This Bitter Earth”) and Billie Holiday (“Good Morning Heartache”). After a casting director saw her perform some Billie Holiday tunes at a New York City concert at Radio City Music Hall, Howard was offered the chance to portray Holiday in a nightclub scene in director Spike Lee’s 1992 film “Malcolm X”. The following year, Howard recorded an entire album of Holiday songs, “Miki Sings Billie”, including her favorite Holiday tune, “Don’t Explain.” In 1993, Howard made another movie appearance in director John Singleton’s “Poetic Justice”. She released “Live Plus” in 1996 and a comeback album of original material, “Can’t Count Me Out”, in 1997. After a four year hiatus, “Three Wishes”, was released in 2001 to excellent reviews. The album earned a Grammy Award nomination for Best Traditional R&B Recording. She followed that with “Pillow Talk” (2006), “Private Collection” (2008), “I Choose To Be Happy” (2015) and a live recording “Miki Howard- Live In Concert” in 2015. Howard was featured on the second season on TV One’s critically acclaimed bio-series “Unsung”. Miki’s episode was the highest rated of her season and in 2015 was adapted into a TV movie for TV One released in June of 2016 with “Chi-Raq” actress Teyonah Parris in the lead role Love Under New Management.